Grease an 8-inch springform pan and line the bottom with a round of parchment paper. Set aside. Prepare pears, by peeling, coring and cutting in half. Set aside. In a large bowl with an electric mixer, or in the bowl of a stand mixer, beat the butter and white sugar together until pale and fluffy. Add the eggs, one at a time, beating well after each addition. Using a spatula, fold in the flour, ground almonds and baking powder. Spoon batter into the prepared springform pan and use a palette knife to even out the mixture. (Batter will be thick and fill the pan only about an inch thick). Arrange the pear halves over the top of the cake and bake in pre-heated 375° oven for 25 minutes. 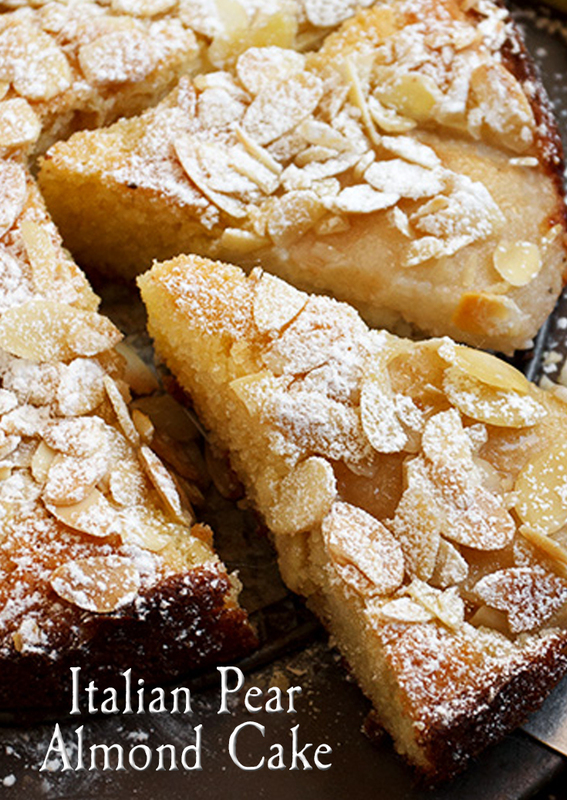 Remove cake from oven and sprinkle the flaked/sliced almonds over the top. Return to the oven for a further 8-10 minutes. The cake is ready when a skewer inserted into the centre of the cake comes out clean. Optional Mascarpone, Marsala and Orange Cream: Whisk the grated rind of 1 orange and 2 Tbsp. of freshly squeezed orange juice in a bowl. Add 2 tablespoons sweet Marsala and 100 g (3 1/2 oz.) of mascarpone cheese. Sweeten with icing sugar to taste.